PlanbookEdu integrates with Google Calendar allowing you to create your plans on PlanbookEdu and have them appear in Google Calendar. 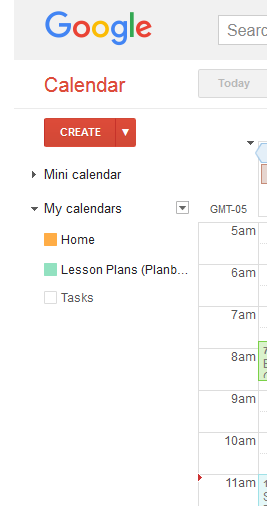 To get started look for the Google Calendar icon when viewing your week of plans. Google Calendar requires that all events occur for a time period. 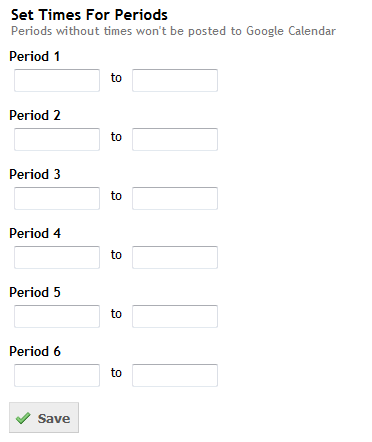 The first time time you attempt to send your plans you'll be prompted to set a time for each period. If you don't want a particular period to appear in Google Calendar you can leave the times for that period blank. You'll then be sent to Google to select an account for your plans. If you have multiple Google accounts you can choose the one you want your plans to appear in. Your plans will appear as a new calendar in Google Calendar. You may need to refresh before the calendar appears. Also make sure the calendar is enabled. When in Google Calendar look on the left in the My Calendars section. Your PlanbookEdu calendar will have the same name as your planbook with "(PlanbookEdu)" added. Once the Calendar is in Google you can make any changes you need to there. You can change the permissions, the name or even the plans. If you no longer want the Calendar in Google you can simply delete it. Only the current week is pushed to Google. You'll need to click the Google Calendar icon for each week you want to appear in Google. Any changes you make won't appear in Google automatically. You'll need to push the week again for the changes to be sent. If you aren't seeing the updates in Google after pushing make sure to refresh. You can do that under the More option in Google or just refresh your browser. Plans are only sent to Google Calendar. There isn't a way to pull plans from Google into PlanbookEdu. Only the text of the plans is sent. Google Calendar doesn't support all the formatting options of PlanbookEdu, so the plans are simplified before being sent.